What happens if you take insulin out of the picture? Let’s say you stop eating these carbohydrates, you take insulin out of the picture, then what happens? This wonderful organ, called your liver, makes some glucose – low amounts of glucose, you don’t need a lot of it. This fat can be used to make both energy and glucose – both from this fat. So you say, “This looks like I would be getting skinnier.” That’s what happens. You get skinnier because these fat cells, they shrink. And I would say, this, for 99% of human history, is the normal way that metabolism worked. Think about carbohydrates, say, for paleolithic man – that’s why they call it the Paleo diet – the only time you would really eat carbohydrates would be during the summer, when fruits are out and when the fruits are ripe. And when those fruits are ripe, you’d want to fatten up for the winter. And that’s exactly what the Paleo diet’s about. He would eat fruits and he would fatten up for the winter. And the thing is that now we have these refined carbohydrates our bodies don’t understand and they’re around yearlong. So we’re not fattening up for the winter, we just kind of fatten up. 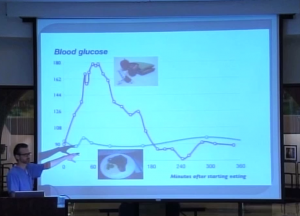 So this is an interesting diagram, this is a blood sugar diagram. This is a guy who’s a healthy guy, and he had two different meals and the meal on top, this meal on top is a tuna sandwich on whole wheat bread, low-fat yogurt, an apple, and an energy bar. He actually ate that while he was at an obesity conference, that’s what they served for lunch. And at the obesity conference where they served that for lunch, his blood sugar went from 90 (that’s like normal blood sugar), to 180 within an hour. So this is like a normal, healthy response to blood sugar when somebody eats these refined carbohydrates. Blood sugar doubles. This meal on the bottom, this is a giant steak, this is bearnaise sauce – bearnaise sauce is egg yolks and heavy cream – sounds very unhealthy. And then he had some vegetables here. And when he ate this meal, his blood sugar the whole time stayed level. And this, this is physiologically normal. If you look at any system in the human body – think about your body temperature. Does your body temperature double three times a day? No. You’d be dead. Think about your blood pressure. Does your blood pressure double three times a day? No, you’d probably be dead. Think about your body’s pH – pH is the acid-base balance in your body – does it double three times a day? No. It stays level, it’s tightly regulated. So eating high protein, high fat, vegetable diet is healthy, normal and physiologic. Eating grains, refined carbohydrates, is not healthy, normal and physiologic because it doubles your blood sugar. And every time the sugar goes up this high, you know what brings the sugar down? Insulin. And every time that insulin shows up in your body you know what the insulin does? 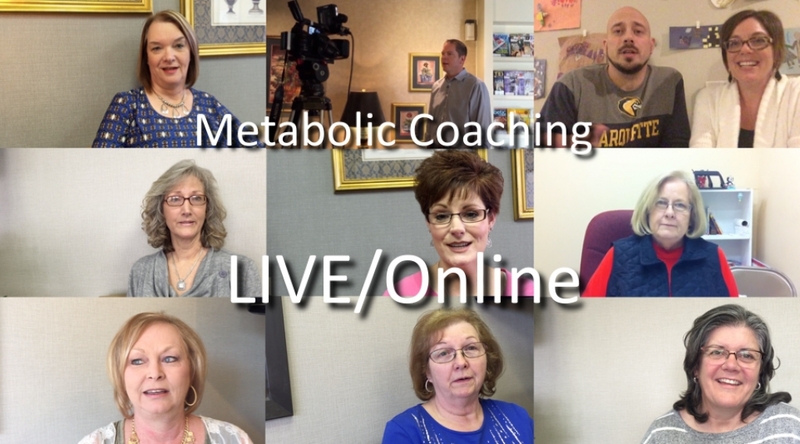 It tells your fat tissue, “Store fat, store fat, store fat, store fat.” The insulin also has a lot of other effects and we’re gonna cover all those also. 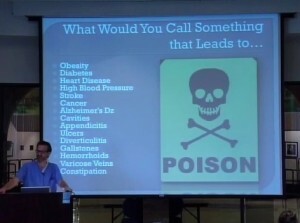 So the problem is this: in societies where people eat refined carbohydrates, they end up with all these diseases. These are called “diseases of civilization.” And that’s because they’re diseases that are common in Western or civilized countries – according to, I guess the people who make the definition of what is a civilized country. 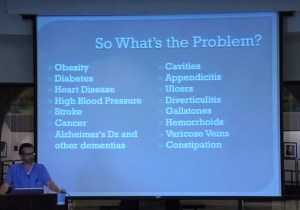 And they include obesity and overweight, diabetes and heart disease, high blood pressure, stroke, cancers, Alzheimer’s disease, cavities – I’m not gonna mention cavities anywhere really in the presentation so I wanna talk to you about that for a second. Dental disease, oral disease has been known for a long time to be associated with heart disease. So the more dental disease you have, the higher at risk you are to have heart disease. And that never really made sense to me, I couldn’t conceptualize why. What dentists will say is, dentists will say, “Well that means you have to brush your teeth three times a day and you need to come get your teeth cleaned twice a year. 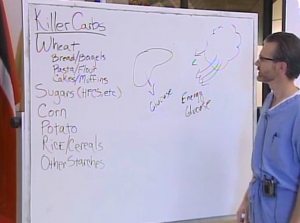 That way you won’t have dental disease so you won’t have heart disease.” But what cavities are and what oral disease is, is it’s an index of carbohydrate consumption. The more refined carbohydrates you eat, which is sugars and starches, the more dental disease you have because the bacteria that cause cavities in your mouth, what they do is they eat, they live off of the carbohydrates that you eat. And then there’s some other diseases: appendicitis, ulcers, diverticulitis, gallstones, and then hemorrhoids, varicose veins, and constipation. These are all common diseases of Western man. Let’s say I had a vial right here and I said, “Look, take this vial, take this, it’s a medicine.” You’d say, “Well, what does it do?” I’d say, “Well this liquid in this vial, it causes obesity, diabetes, heart disease, high blood pressure, stroke, cancer, Alzheimer’s disease, cavities, appendicitis, ulcers, diverticulitis, gallstones, hemorrhoids, etc.” What would you say? No way! You wouldn’t take the vial because you’d recognize what it is. So what would you call what I had in that vial? Anybody wanna throw something out? Syrup? Syrup, a toxin, a poison. And that’s what I’m telling you, is that these refined carbohydrates to you are poison. And I’m not saying that they’re a poison for everyone, because everybody knows somebody in their life who can eat whatever they want, I mean, my brother-in-law can eat as much as he wants, whenever he wants, whatever he wants, and he always starts dinner with two desserts. That’s where it begins, two desserts start dinner and then he eats a meal. And he’s real thin. So, are refined carbohydrates a poison to him? Probably not. 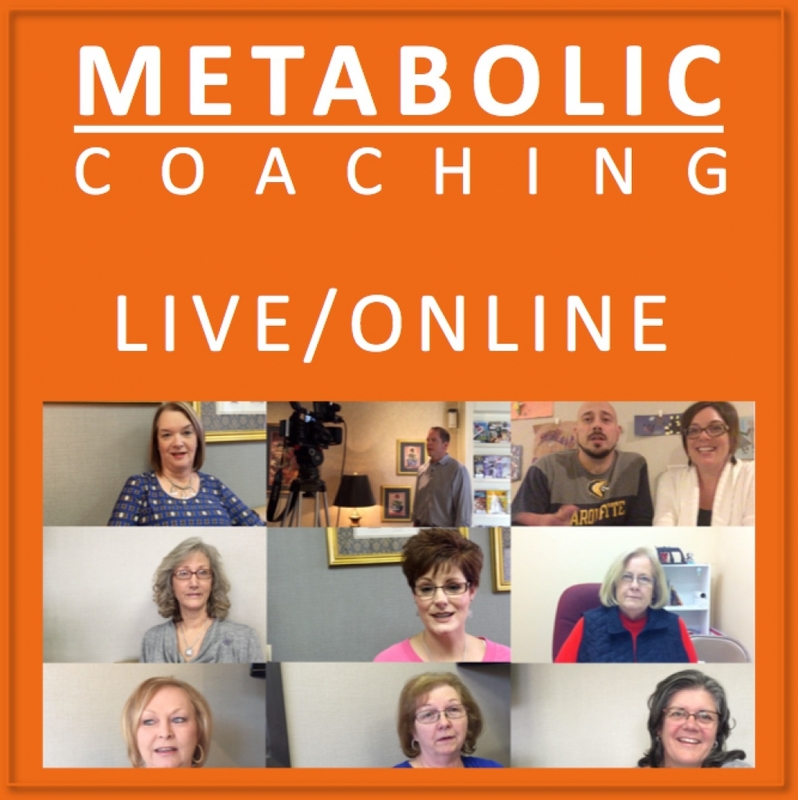 But if you’re struggling with your weight, if you have diabetes, if you have high blood pressure, if you have high cholesterol, obesity, if you’re just having trouble achieving your ideal weight and maintaining it, then these foods are, to you, a poison.